Babysitting rules are essential if you are like me and are known in your family as the one who loves the kids. Yes, Muffy luv the kids. So it’s no surprise when I get a last-minute babysitting request and in attempt to give my children the same experiences of having a sleepover with cousins who pee the bed and running amok in the neighborhood with a whole crew of folks, I usually oblige. But what I’ve realized over the years is that parents are losing their babysitting etiquette skills. From sloppy overnight bags to late night pick-ups, I think its time for a little lesson in babysitting rules. There is nothing worse for a babysitter than finding out your child has wet their pants and was only sent with one pair of underwear. That means the sitter now has another duty added to the list of things she has to do with an already full house. My general babysitting rule of thumb when sending my kids is to pack for double the amount of time they will be away. So, if my sons are spending the weekend at grandmas they have four full outfits (underwear, socks, t-shirts included). 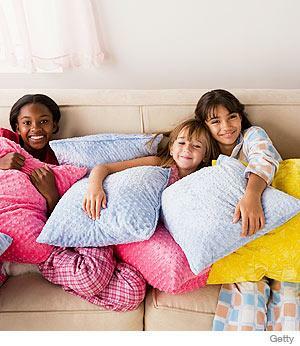 If you’re sending your kids to a birthday party and sleepover, the worst thing is to make the hostess stop the party to find your kids clothes. If your child is spending more than one day with a sitter the least you can do is to arrive on pick-up day at noon. The sitter has already volunteered to watch your child for an extended time so allow her the courtesy of preparing for the next day. Not to mention, extended stays can take a toll on the sitter’s budget. If parents fail to pick-up by 12 p.m. the caregiver has to provide yet another snack or dinner for your children. I can also break these rules down for you in this video. While your kids are staying with another adult please encourage them to follow the rules of that household. Outside of the rules doing the child physical or emotional harm, if the parents trust the adult enough to leave their child, they should trust them enough to make sensible rules for their household. Nothing is worse than when a sitter dishes out a house rule only to have the child refuse and say “that’s not how we do it at my mom’s house.” When this happens all the kids, even the kids who live there, think it’s okay to break the rules. Please do not expect a mom who already has two children to keep all five of yours. Whether you ask another sitter to watch two kids, or ask a relative to spend a day with your sitter, it is unrealistic to expect your children to have a pleasant babysitter experience when the sitter is overwhelmed. I have three children, and my general rule is that I will send a friend or relative to aid in 1/3 of the sitting time if my sitter has more than one child. If they are staying for 3 days, I will ask my mom to stop over for the second day. Remember pick-up is at noon, so the third day is a half day. Mommies with two or fewer children are generally exempt from this rule. But, if you have three or more children please be aware that the household may not be equipped with all of the food your kids need, or want. The polite thing to do is to always ask the sitter if she needs groceries, or send food that you know your children will eat. One of the most important things I remember when sending my kids to the sitter is that the condition they are sent in is representative of my household. My mother always says people treat you the way you treat yourself. The same applies to your children. If a parent doesn’t think enough of their children to set their own standards for sitting, the sitter may fail to set standards as to how she treats your children.